We have been working with Argos to create a new concept. From the initial idea to completion, it has been a truly integrated project with our interiors, graphics and digital teams working together with the Argos client team to create a unified vision for the Argos brand and customer experience. We saw an opportunity to create a stronger connection between how customers shop in store and online. With this in mind, we developed a digitally integrated space, from the shopfront, through to browsing, purchase and supporting targeted promotions. We have designed a pared-back environment; the clarity of the space complete with raw and clean materials provides the perfect foil for the rich and dynamic digital content. We worked on all elements of the concept from the interior environment and digital content, to the in-store communications and tone of voice. in Colchester and Dunfermline. The London stores are remodels of existing stores, while Colchester and Dunfermline are new store locations. The new stores have a fresh and modern look. They offer a new 60-second ‘Fast Track’ collection service for customers purchasing goods online or via mobile devices. 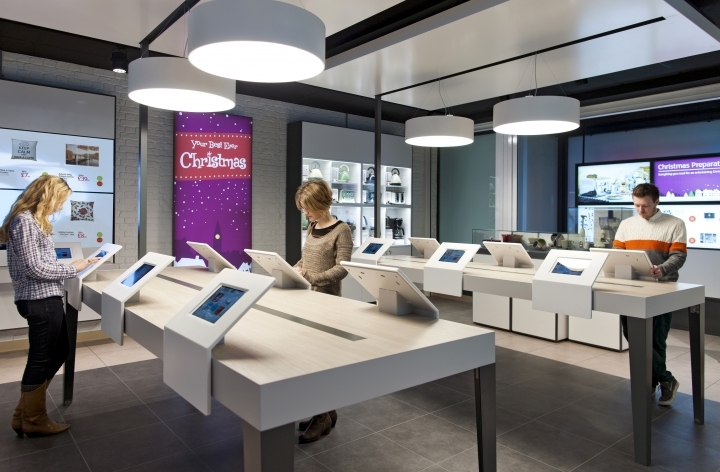 Customers shopping in store will use iPads, with expanded shopping applications such as product videos and customer reviews, or personal mobile devices via free in-store WiFi, rather than Argos’ classic laminated catalogues, pencils and stock checker machines. Catalogues are not disappearing in the near-term; they will still be available to collect from colleagues or as shopping aides in the newly designed customer service area. Dynamic digital display screens will replace static sales literature and paper posters, and together with flexible product displays will offer innovative ways to inspire customers and support suppliers. 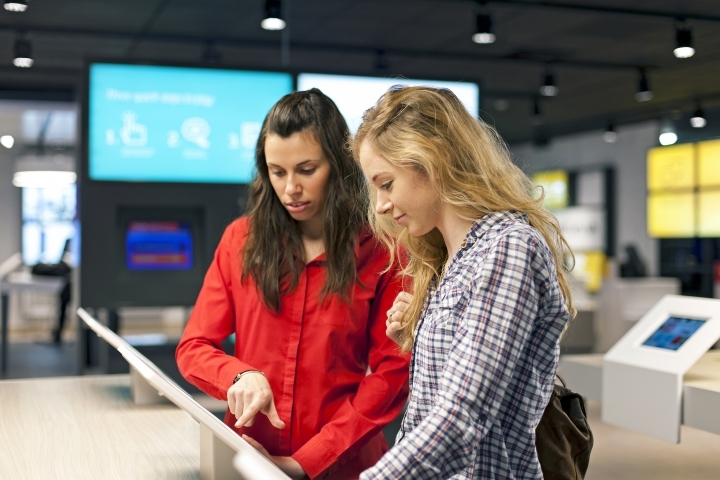 With customers increasingly using digital channels for shopping and transacting, more Argos store colleagues can help customers on the sales floor to navigate digital resources and make the right purchase decision. 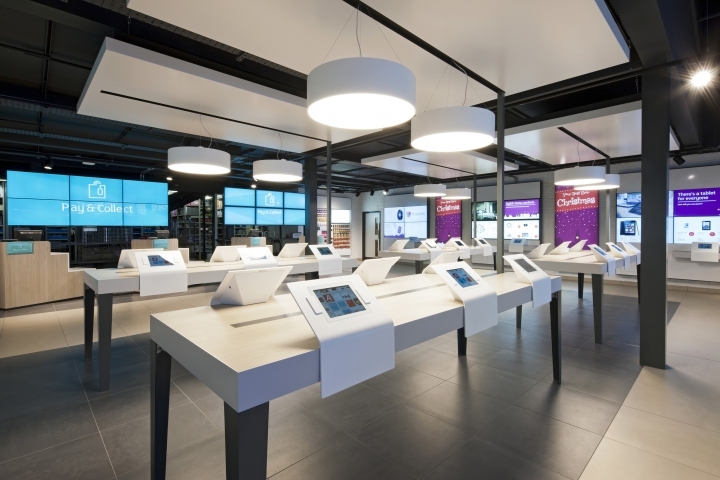 Behind the scenes, the new London-based digital concept stores will also trial Argos’ innovative hub & spoke distribution model. The larger ‘hub’ store will stock an expanded range of around 20,000 lines, and run routes to deliver products in a van to its smaller ‘spoke’ stores. This will provide all stores with either immediate, same day or next day access to an expanded range of products. The store frontage will elevate the eye-catching Argos red branding to replace the current Argos blue for maximum high street impact. Window displays of digital screens can be dynamically changed centrally to showcase seasonal and category promotions – replacing static paper posters. 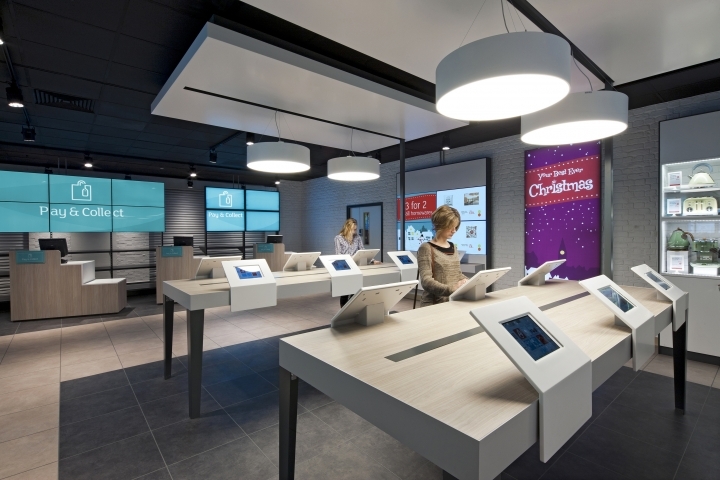 On arrival, customers are greeted by the digital ‘Welcome Wall’ where store staff are introduced. The short films of store employees add personality to each store and initiate a personal connection between the staff and the customer. The footage is combined with other local messaging, such as weather or social media activity and links the store back to its wider community. Once in store there are two routes. Fast Track offers the promise that you can buy online, at home or on the move, and collect your item in store with a reduced queue time. Around one third of customers place online reservations and come to store to pick up their purchases. 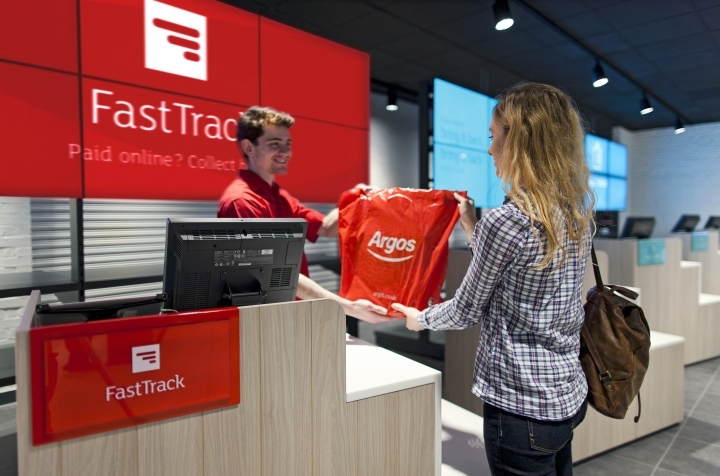 For the first time Argos will offer customers the opportunity to pay for their orders online. These customers will be able to collect their purchase in just 60 seconds at designated Fast Track collection podiums in the new stores. For those shopping in store, customers can visit a single stop, the ‘Pay and Collect’ podiums, to complete their transaction. Some 50% of Argos customers pay and collect in store. 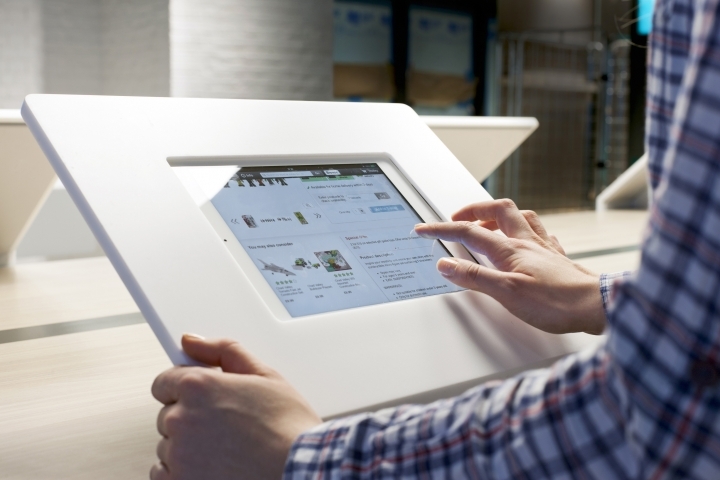 Tables of iPad tablets replace the laminated catalogue, electronic stock checkers, pencils and paper slips enabling customers to browse across the full c.30,000 range, watch product videos and read reviews, check stock and add items to the digital shopping trolley. Argos are not removing catalogues from the store, since some customers may be more comfortable using them for their shopping. But they will be placed on the customer service desk, together with an iPad, so that colleagues might be able to assist these customers in becoming more comfortable with the enhanced shopping options with digital technology. While Argos stores are primarily for product collection, store displays will serve two important purposes – creating customer inspiration and providing suppliers with in-store marketing opportunities.New inspirational shop floor displays, and shop-within-a-shop displays, will showcase specific ranges such as toys, consumer electronics and jewellery, or support events with suppliers such as Dyson or Samsung. These displays can be rapidly changed to reflect the latest promotions and events being driven by the business and suppliers. New inspirational shop floor displays, and shop-within-a-shop displays, will showcase specific ranges such as toys, consumer electronics and jewellery, or support events with suppliers such as Dyson or Samsung. 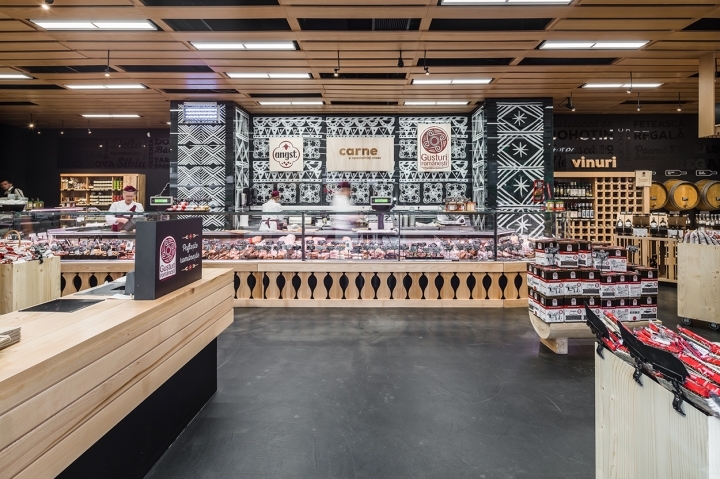 These displays can be rapidly changed to reflect the latest promotions and events being driven by the business and suppliers.A newly designed customer service area has been included in the concept stores, with high-level tables and stools. Here customers can browse online, review a catalogue, or obtain information or assistance from Argos colleagues on topics such as product returns or credit applications.